On tap for year 2 of Operation Rio Grande? Stop the dispersement of drug dealing and find jobs for people who are homeless. (Francisco Kjolseth | The Salt Lake Tribune) Leadership and partners of Operation Rio Grande, including Commissioner Keith Squires, Mayor Jackie Biskupski and Chief Mike Brown, from left, meet at The Gateway on Tuesday, Aug. 14, 2018, to report on the first year of Operation Rio Grande, which launched Aug. 14, 2017. Agency leadership and staff will reported on the three phases of the operation which focused on improving public safety, drug and mental health treatment and employment. (Francisco Kjolseth | The Salt Lake Tribune) Leadership and partners of Operation Rio Grande meet at The Gateway on Tuesday, Aug. 14, 2018, to report on the first year of Operation Rio Grande, as Amy Daeschel tells her story of ending up homeless and being helped back to a better life by the program which launched Aug. 14, 2017. Agency leadership and staff will reported on the three phases of the operation which focused on improving public safety, drug and mental health treatment and employment. (Francisco Kjolseth | The Salt Lake Tribune) Leadership and partners of Operation Rio Grande meet at The Gateway on Tuesday, Aug. 14, 2018, to report on the first year of Operation Rio Grande, which launched Aug. 14, 2017. Agency leadership and staff will reported on the three phases of the operation which focused on improving public safety, drug and mental health treatment and employment. Rick Egan | The Salt Lake Tribune Amy Baeschel drags a shopping cart full of her belongings as she and other homeless campers are forced to remove their belonging from the Rio Grande Area, as the Salt Lake County Health Department brings in heavy machinery to clean up the area, Thursday, July 6, 2017. (Francisco Kjolseth | The Salt Lake Tribune) Leadership and partners of Operation Rio Grande, including House Speaker Greg Hughes, left, and Senate President Wayne Niederhauser meet at The Gateway on Tuesday, Aug. 14, 2018, to report on the first year of Operation Rio Grande, which launched Aug. 14, 2017. Agency leadership and staff will reported on the three phases of the operation which focused on improving public safety, drug and mental health treatment and employment. 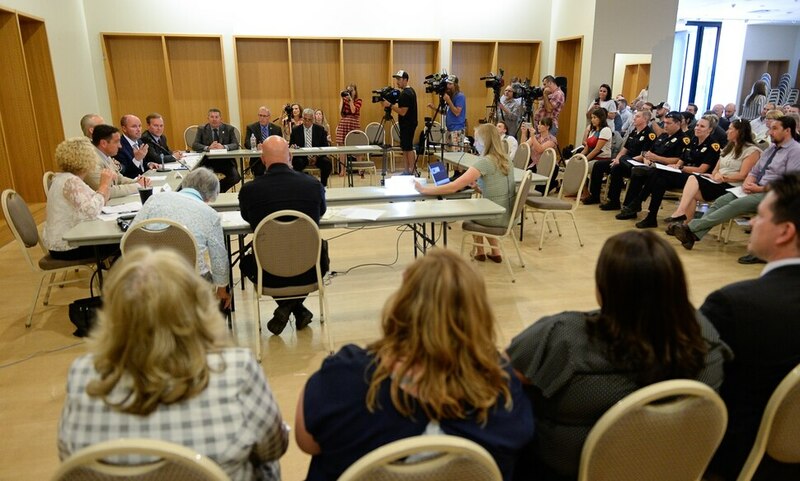 A collection of state, county and city officials who came up with the campaign on crime and homelessness centered in downtown Salt Lake City met Tuesday to recap the successes they’ve had so far in improving conditions around the 1,100-bed shelter in the Rio Grande district. They’ve rapidly increased the number of drug treatment beds available, which has helped people like Amy Daeschel, who said Tuesday she was homeless and helplessly addicted to heroin before she was arrested within two weeks of Operation Rio Grande. She is now clean and on track to graduate from drug court this October. The officials who planned and launched the two-year operation say the millions spent on policing and other services have led to an average of five fewer days spent in shelter for a homeless Utahn, from 48.5 days in 2017 to 43.5 days this year. There has been a dramatic decrease in crime in the Rio Grande neighborhood and across Salt Lake City. But issues have spread from the core of downtown into surrounding neighborhoods, and officials vowed to focus on stopping that dispersement during the second year of the operation. They will also continue work to find jobs for people working to get out of homelessness. A major issue that needs to be addressed remains a lack of low-income housing in all parts of the city, county and state.